Everyone wants to succeed in life. But what causes some of us to be more successful than others? Is it really down to skill and strategy &ndash; or something altogether more unpredictable? This book is the word-of-mouth sensation that will change the way you think about business and the world. It is all about luck: more precisely, how we perceive luck in our personal and professional experiences. Nowhere is this more obvious than in the markets; we hear an entrepreneur has &lsquo;vision; or a trader is talented;, but all too often their performance is down to chance rather than skill. It is only because we fail to understand probability that we continue to believe events are non-random, finding reasons where none exist. This irreverent bestseller has shattered the illusions of people around the world by teaching them how to recognize randomness. Now it can do the same for you. The only article Lady Fortuna has no control over is your behavior. Good luck. Start stressing personal elegance at your next misfortune. Exhibit sapere vivere ("know how to live") in all circumstances. The only article Lady Fortuna has no control over is your behavior. What characterizes real speculators like Soros from the rest is that their activities are devoid of path dependence. They are totally free from their past actions. Every day is a clean slate. 证伪容易证实难。I can use data to disprove a proposition, never to prove one. I can use history to refute a conjecture, never to affirm it. I can use data to disprove a proposition, never to prove one. I can use history to refute a conjecture, never to affirm it. 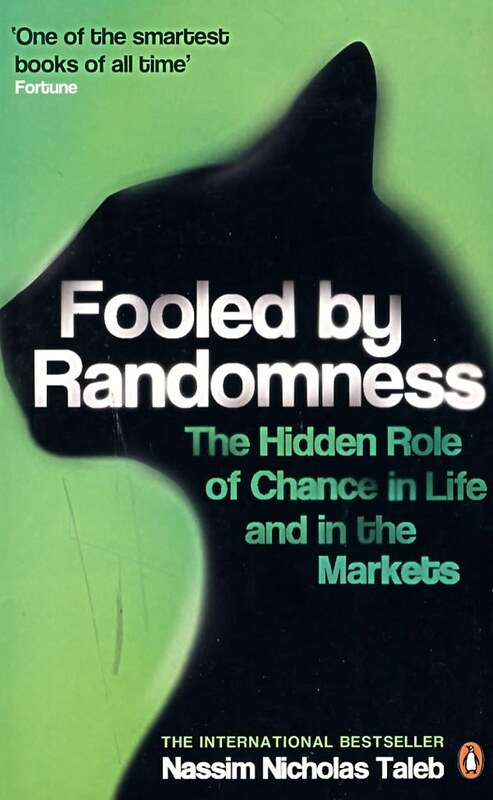 A Review of Market Fools of Randomness Constants: An overestimation of the accuracy of their beliefs in some measure, either economic or statistical. A tendency to get married to positions. The tendency to change their story. No precise game plan ahead of time as to what to do in the event of losses. Absence of critical thinking expressed in absence of revision of their stance with "stop losses". Denial. How to cheat people ? Select 5000 people and separate them equally to two groups A and B.
Email to Group A to tell them that the SP500 rise tomorrow. Email to Group B to tell them that the SP500 fall or stay the same level tomorrow. Email to the Group such that met the fact of SP500 performance. Repeat Day 1 action to the chose group of Day 2. Continue till you decide to cheat the group which believes that you can predict the market and let them to handle money to invest for them. Run away with the money. Consider the founders of QQ, Alibaba, Facebook, Microsoft, Apple. Are they really perfect to deserve those achievements ? They are really excellent, but how much does luck contribute to their success ? Of course, intelligence and diligence plays a central role. So many people from the same areas worked equally hard towards the same goal but not at the right time and failed. It looked like God rolled a dice at some time when He was awake and the lucky guys got passed. How to overcome randomness ? If the past of me was pretty much dominated by randomness, will I continue to be a fool in future ?